Well everyone, it is finally Spring in New England. For many of us it felt like July yesterday – with highs in the upper 80s, which was a big much. In the Boston area, winter decided to finally arrive in March and it was freezing and we had quite a bit of snow. It was hard going for a couple of weeks because we were all ready for Spring. I love organic gala apples and peanut butter as a snack. It is one of the things that will really take away hunger and keep me fueled for a couple of hours at least! SC and I have both been very busy this spring. Working on the weekends sometimes an having long work days. Sometimes it is hard to find things to eat and eat healthy when you are so busy! But we do our best. 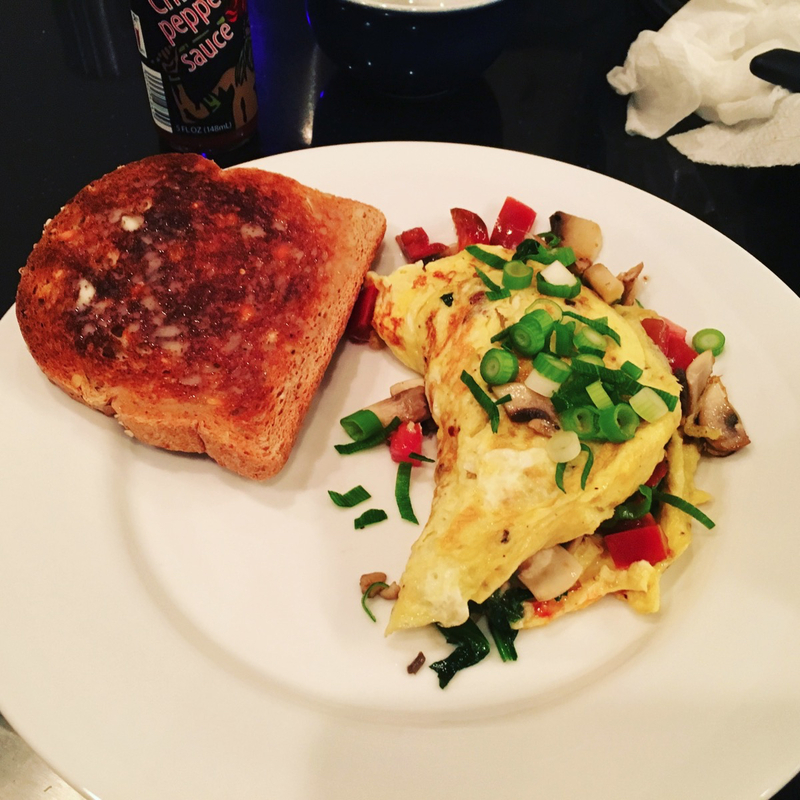 One of my go to dinner’s when we don’t have a lot of food in the house is a veggie omelette – this is always delicious!! This omelette I had scallions, spinach, mushrooms and tomatoes. It was so good! The other night I was too exhausted to make dinner after a long day of driving to and from work, a long work day and two workouts. So thankfully SC took over for dinner. People always say that meals that someone else makes for you always taste so much better – and I have to agree! 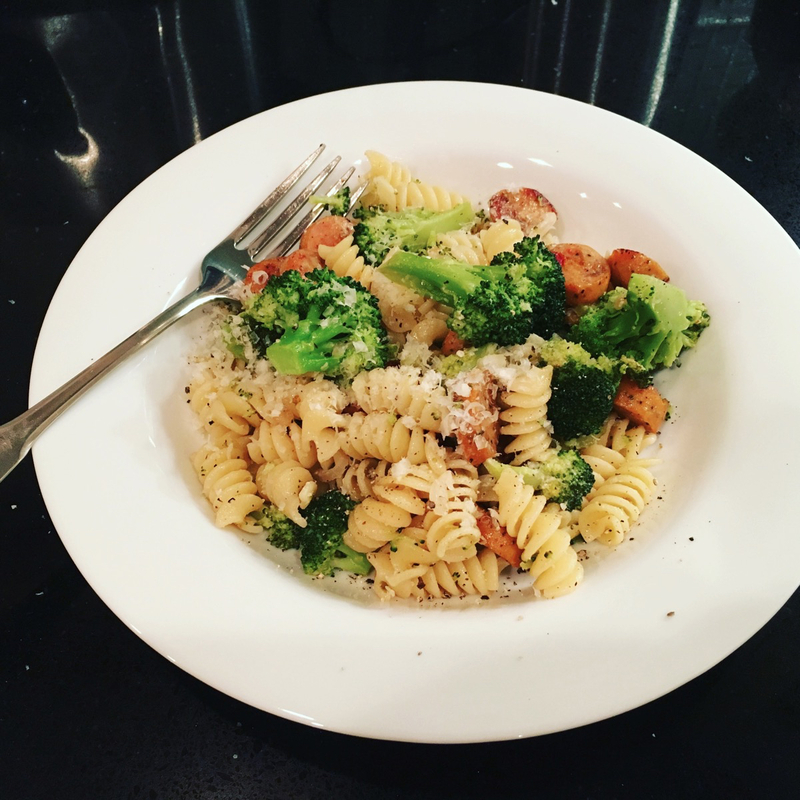 This dinner was pasta, grilled chicken sausage and steamed broccoli – topped with freshly grated parmesan. It really hit the spot! SC and I are really excited to get our grill out now that the nice weather is here. I can’t wait to grill some turkey burgers and for some really weird reason I’m craving grilled hot dogs (so strange) because I have been smelling them all around our neighborhood! I have the day off from work to watch the Boston Marathon – it is my favorite day of the year, because normally by now (if I’m not actively training for something) I need to be inspired to get back into some serious running. This year I definitely need to get back into a routine – and the Marathon has been inspiring me all weekend. After watching the coverage, I’ll get to the grocery store to get us ready for the rest of the week. Stay tuned for some (hopefully) fun ideas, I’ll be reporting on what we are eating this week! Thanks Heather. This reminds me that as well as eating well, exercise is also important. Looking forward to your next blog!